ELA.RL.4.2: Determine a theme of a story, drama, or poem from details in the text; summarize the text. ELA.RL.4.3: Describe in depth a character, setting, or event in a story or drama, drawing on specific details in the text (e.g., a character's thoughts, words, or actions). ELA.RL.4.1: Refer to details and examples in a text when explaining what the text says explicitly and when drawing inferences from the text. ELA.RL.4.4: Determine the meaning of words and phrases as they are used in a text, including those that allude to significant characters found in mythology (e.g., Herculean). ELA.RL.4.5: Explain major differences between poems, drama, and prose, and refer to the structural elements of poems (e.g., verse, rhythm, meter) and drama (e.g., casts of characters, settings, descriptions, dialogue, stage directions) when writing or speaking about a text. ELA.RL.4.10: By the end of the year, read and comprehend literature, including stories, dramas, and poetry, in the grades 4-5 text complexity band proficiently, with scaffolding as needed at the high end of the range. ELA.RI.4.2: Determine the main idea of a text and explain how it is supported by key details; summarize the text. ELA.RI.4.3: Explain events, procedures, ideas, or concepts in a historical, scientific, or technical text, including what happened and why, based on specific information in the text. ELA.RI.4.1: Refer to details and examples in a text when explaining what the text says explicitly and when drawing inferences from the text. ELA.RI.4.5: Describe the overall structure (e.g., chronology, comparison, cause/effect, problem/solution) of events, ideas, concepts, or information in a text or part of a text. ELA.RI.4.4: Determine the meaning of general academic and domain-specific words or phrases in a text relevant to a grade 4 topic or subject area. ELA.RI.4.8: Explain how an author uses reasons and evidence to support particular points in a text. ELA.RI.4.7: Interpret information presented visually, orally, or quantitatively (e.g., in charts, graphs, diagrams, time lines, animations, or interactive elements on Web pages) and explain how the information contributes to an understanding of the text in which it appears. 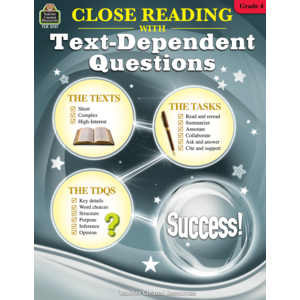 ELA.RI.4.10: By the end of year, read and comprehend informational texts, including history/social studies, science, and technical texts, in the grades 4–5 text complexity band proficiently, with scaffolding as needed at the high end of the range. ELA.RF.4.3: Know and apply grade-level phonics and word analysis skills in decoding words. ELA.RF.4.4: Read with sufficient accuracy and fluency to support comprehension. ELA.W.4.2: Write informative/explanatory texts to examine a topic and convey ideas and information clearly. ELA.W.4.1: Write opinion pieces on topics or texts, supporting a point of view with reasons and information. ELA.W.4.3: Write narratives to develop real or imagined experiences or events using effective technique, descriptive details, and clear event sequences. ELA.W.4.8: Recall relevant information from experiences or gather relevant information from print and digital sources; take notes and categorize information, and provide a list of sources. ELA.W.4.7: Conduct short research projects that build knowledge through investigation of different aspects of a topic. ELA.W.4.9: Draw evidence from literary or informational texts to support analysis, reflection, and research. ELA.W.4.10: Write routinely over extended time frames (time for research, reflection, and revision) and shorter time frames (a single sitting or a day or two) for a range of discipline-specific tasks, purposes, and audiences. ELA.SL.4.1: Engage effectively in a range of collaborative discussions (one-on-one, in groups, and teacher-led) with diverse partners on grade 4 topics and texts, building on others' ideas and expressing their own clearly. ELA.SL.4.3: Identify the reasons and evidence a speaker provides to support particular points. ELA.SL.4.4: Report on a topic or text, tell a story, or recount an experience in an organized manner, using appropriate facts and relevant, descriptive details to support main ideas or themes; speak clearly at an understandable pace. ELA.SL.4.6: Differentiate between contexts that call for formal English (e.g., presenting ideas) and situations where informal discourse is appropriate (e.g., small-group discussion); use formal English when appropriate to task and situation. ELA.L.4.2: Demonstrate command of the conventions of standard English capitalization, punctuation, and spelling when writing. ELA.L.4.1: Demonstrate command of the conventions of standard English grammar and usage when writing or speaking. ELA.L.4.3: Use knowledge of language and its conventions when writing, speaking, reading, or listening. ELA.L.4.6: Acquire and use accurately grade-appropriate general academic and domain-specific words and phrases, including those that signal precise actions, emotions, or states of being (e.g., quizzed, whined, stammered) and that are basic to a particular topic (e.g., wildlife, conservation, and endangered when discussing animal preservation). ELA.L.4.5: Demonstrate understanding of figurative language, word relationships, and nuances in word meanings. ELA.L.4.4: Determine or clarify the meaning of unknown and multiple-meaning words and phrases based on grade 4 reading and content, choosing flexibly from a range of strategies.